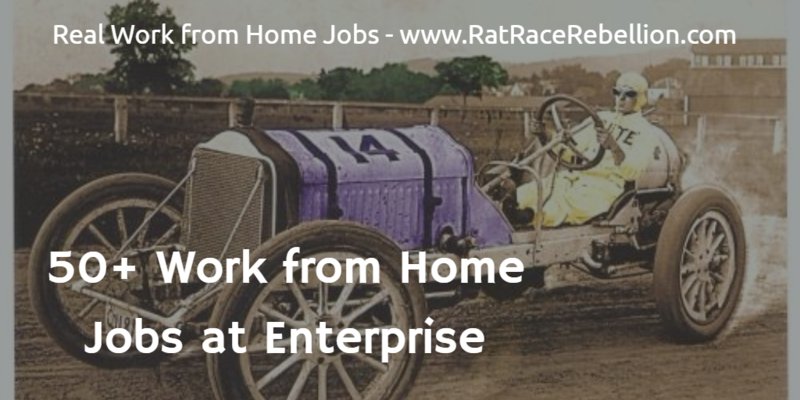 Enterprise Rent A Car has been hiring work from home Customer Service Agents and similar employees for years. The jobs are usually tied to a specific metro area. Here’s a quick summary of 51 openings they have now. Work from Home Customer Service Representative (Various metro areas) — Full-Time. Pays $12.50 / hr. with possible bonuses based on individual and team performance. You’ll handle inbound calls, which can also include roadside assistance calls. Work from Home Reservation Sales Representative (Various metro areas) — You have to be able to work a 40-hr. week, but schedules are based on business need and could include morning, afternoon, and evening hours. “All schedules require working both weekend days, Saturday and Sunday.” Pays $12.50 / hr. plus commission. You’ll handle inbound calls from people who want to rent a car. Your job is pretty straightforward — get as many reservations as possible. No Macs are allowed in either position, and as in all phone-oriented jobs handling customers, you’ll have to have a quiet place to work. Enterprise also has a few bilingual French positions in both roles. To go straight to the jobs, click here. For more jobs like these, see our Call Center and Customer Service Jobs page. This entry was posted in Customer Service Jobs, Work at Home Jobs and tagged Enterprise Rent A Car. Bookmark the permalink.